Session is aimed toward turns technically, but focuses on penetration tactically. Instructions: Players spread out making sure they have enough room for themselves and can also see the coach well enough. Organization: 10x10 box for each pair. Instructions: Players dribble at their own speed toward each cone and preform an L-turn at each cone. Coaching Points: Entry, Execution, Exit touch, vision, selling it with body. 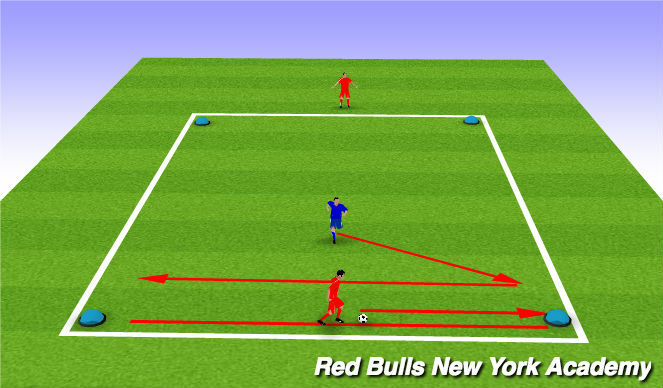 Instructions: Attacker dribbles to each cone trying to find the passing lane to the target player. However, defender is instructed to passively defend the first and second turn. At which point the attacker would pass to the opposite side and become the passive defender. Defender takes the place of the attacker. Instructions: Defender is live now on attackers first touch to either side. Attacker is looking to find the passing lane forward to the target player. If the attacker can successfully find the target player each player is awarded 1 point. Defenders can not earn points. Coaching Points: Ball out of feet and look forward to move defender. If it is on play as quickly forward as possible, if not look to change direction. Defender plays the ball then closes the space.